Have you ever gone down a path only to find out later on it was not what you expected? I lived to play soccer! It was an exciting, non-stop, action sport that I was good at! I followed several of my high school teammates from Atlanta, Georgia to play at Clemson University back in the 70’s. My best friends were on the team. I was living my dream, but something was missing in my life, and I couldn’t identify it. I began the year with high expectations. It didn’t take long before my expectations crashed and burned as I sat on the bench, week after week, and watched my friends play. Little did I know God was using this to get my attention. I was surprised at how angry I was at the coach and jealous of my teammates. Conversely, when I got to play, which only happened once in my freshman year, I was happy. Why were my emotions tossed up and down by my circumstances? Because I was my own god! When I got what I wanted, when I wanted it, and how I wanted it, then I was happy. If I didn’t get my way, then I was angry, depressed, or jealous. This self-centeredness is what the Bible calls sin. This sin separated me from God and real life. I discovered that freedom from this selfishness and resulting guilt only came through Jesus Christ. Some students explained to me that God loved me so much that Jesus died on a cross for all of my sins, which were many. Then to prove He was God, he miraculously rose from the dead, and now lives in heaven. The Bible says, “For by grace you are saved through faith, and that not of yourself, it is the gift of God, not as a result of works, that no man should boast.” I received the free gift and gave Him complete control of my life when I was nineteen years old. Jesus Christ has far exceeded my expectations for over 40 years! He has given me the strength to love others more than myself, and I know I am going to heaven when I die! Would you like to know God personally and know you are going to heaven? Please contact me if you have any questions. Faithwalkers December 27-31 Danelle & I went to Asheville, NC to participate in the annual Great Commission conference with 800 students (photo below). Our marriage seminar went well, with many deep questions at the end. Brian Bridgeman had asked Steve to assist him with teaching, “How To Avoid The Comparison Trap.” At the last minute, Brian’s little girl got sick, and he and his wife had to take her home. God gave Steve much grace to teach the entire seminar to an enthusiastic overflow crowd. Praise God! Thank you for praying! A Personal Testimony Have you ever noticed how personal testimonies are constantly used on the radio and television to sell products from dog food to diets, from cars to dating services? People testify as to the effectiveness of a product or service. Hard to beat that! We listen. We remember. Often, we buy! We are going to include a testimony tract in each newsletter for the next few months, for your edification and inspiration. Maybe you want to write yours? Let us know if we can help. Secure In An Insecure World Do you know any Hispanic folks that need to find a personal relationship with Jesus, or any that could benefit from understanding Biblical principles for marriage and relationships? The Spanish edition of Steve’s book fits that bill, and it is now available on Amazon! It is a great tool to give to your unbelieving friends, as it contains Steve’s testimony and a clear presentation of the gospel. The book is useful to those who are dating or considering getting married. Clemson Danelle and I will teach a seminar for students at Clemson and Southern Wesleyan over Valentines weekend, February 14-15. Pray for God to change lives! 1. Valentines Conference. Pray for many college students to come and invite their unbelieving friends. Pray for Danelle and I to be empowered by the Spirit, for needs to be met, and relationships transformed. 2. 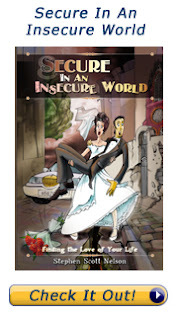 Secure In An Insecure World. Ask God to use the new Spanish and English versions to change lives around the world! 3. House Church Ask God to use our house church to lead many to Jesus in Atlanta, including internationals – Hispanic, Russian, etc. Pray for our faith to be strengthened. Hebrews 11:6. 4. Ukraine. You may have heard about the ongoing political upheaval in Ukraine and the protests in the streets. Timmy Powers is presently in Ukraine until February 12th. Pray for his ministry to be effective and for his safety and health. Our friends there tell us that God is using this bad situation to bring people to Him. Pray for true peace through people turning to Christ. 5. Summer Plans. Please pray for clear direction, the finances, and God’s grace for us as we plan to go to Spain and Orlando this summer to teach students at LINC (Labors Impacting Nations for Christ) in both of these locations.